Back by popular demand, I will be doing a Parent Education Talk/Fundraiser Event on January 28th at Milestones Preschool. Hot topics on pediatric health, -nutrition, and -holistic medicine will be covered. Highly educational, practical, and for a good cause. Read the flyer for details and to RSVP. I will be speaking about this hot topic at the Integrative Pediatric Wellness Center on Sat. 11/15 at 3pm. I will cover how modern day nutrition - with its highly processed, corporate-profit driven nutrition standards, can cause or exacerbate these Contemporary Chronic Childhood maladies, or the 3Cs. I will in turn teach you how Real Food Nutrition can be a powerful tool to use to heal the 3Cs. $20 per person if registered by 11/12. $25 per person after 11/13 and at the door. Space is limited. RSVP required. Please click here to RSVP. Thank you. 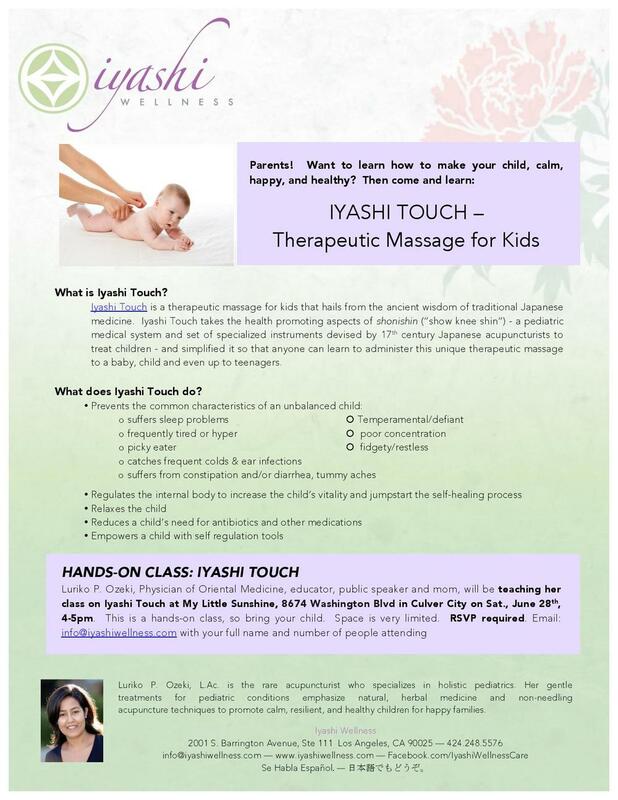 As part of the grand Summer Solstice Celebration being held in the Culver City Arts District, I am teaming up with My Little Sunshine to promote Oriental Medicine for kids! From 12-4pm, I will be available for questions and answers and will do demos for any willing participant to experience the techniques I use for children. My Little Sunshine will also have other companies and services at the store geared for baby and children needs, with discounts throughout the store. To learn more about the specials going on that day at My Little Sunshine, click here. To learn more about all the venues participating in the celebration and specials being offered at the Culver City Arts District, click here.